If you’re an artist, then there’s nothing you love more than creating something new. Whether you paint, sculpt, or draw, there’s something satisfying about finishing a piece. You may or may not sell your art, but what’s most important is that you have somewhere you can work. At Better Built Barns in Oregon, our custom sheds can provide the perfect solution for your new backyard artist’s studio! Many artists pursue their creative passions on the side, getting to it whenever they can outside of work or taking care of the kids. This leads them to set up a studio in the house, either in a spare bedroom or the basement. While this can suffice for a little while, the rest of life’s demands can creep in on the creative space, and you might need the room for something else. By putting up a new shed, you can get your studio out of the house and into its own dedicated space. You’ll have room for your paints, brushes, sculpting tools, or whatever else you need. Instead of taking over a room in the house, you can spread out and work at your own pace! Art can be messy, with paints, clay, and other materials needed to complete your latest creation. If you’re working in the house or renting a local studio space, then you likely need to clean up the best you can after each session. With a dedicated shed space, you can leave a mess and come back to your project when you have time. This is especially true if you’re using power tools or other large equipment to create your artwork. Metal and wood can leave quite a mess, and if you’re welding a sculpture or carving a wooden piece, then you’re going to need the right tools. With a backyard shed, you can run the welder or power tools without disturbing others (except maybe your neighbors), and you can leave them out when you’re done for the day. All you have to do is lock the shed and come back to your work the next day! If you work on larger pieces of art, then you’re going to want a space that’s large enough to accommodate the piece you’re working on, as well as the pieces that you’ve recently finished. At Better Built Barns, we have a number of sheds and buildings to choose from, and you can pick the one that best suits your needs, or we can recommend one based on your specifications. Regardless of which shed you choose, you can count on us putting it up in no time at all. Most builds are done in one day, and our team works quickly and diligently to make sure that everything is installed correctly. 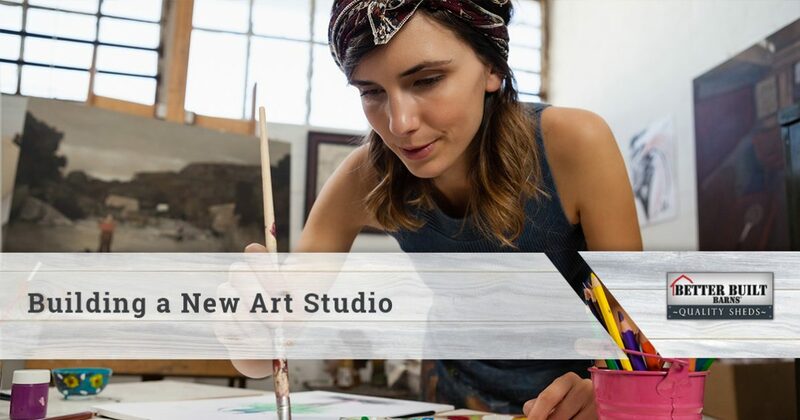 Before you know it, your new backyard art studio will be finished and you’ll be able to create new and exciting pieces! Contact us today to learn more about our custom sheds. We look forward to hearing from you!